^ "Ammanford, Carmarthenshire web site". Terrynorm.ic24.net. Retrieved 2013-02-10. ^ "A Splotch of Red - Keir Hardie in Westham". 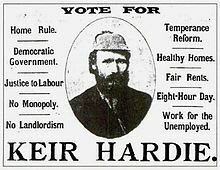 A Splotch of Red - Keir Hardie in Westham. Retrieved 2016-10-12. This page was last edited on 3 April 2019, at 17:51 (UTC).